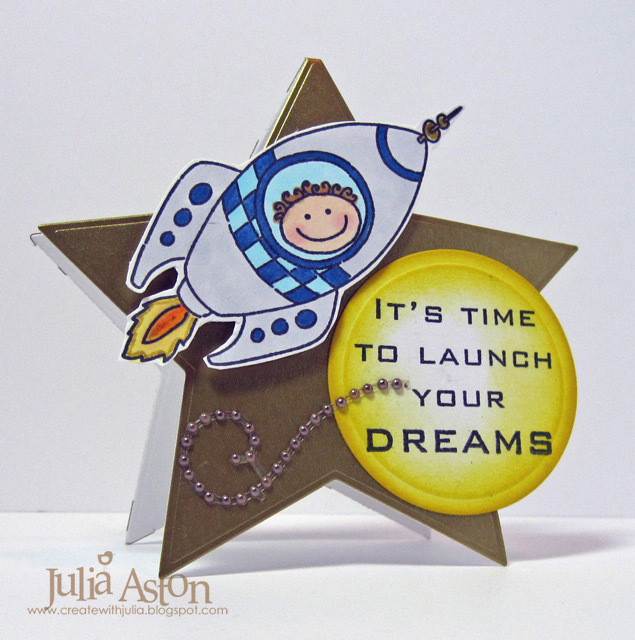 Welcome to Day 3 of the Waltzingmouse Sneak Peeks - Are you excited as I am by the new stamps so far??? Looky what we have today BANNERS!!! whoo hoo! We have big banners and little banners! Decorative banners and simple banners! These little banners are from the new set being released March 1 called Bitty Banners. 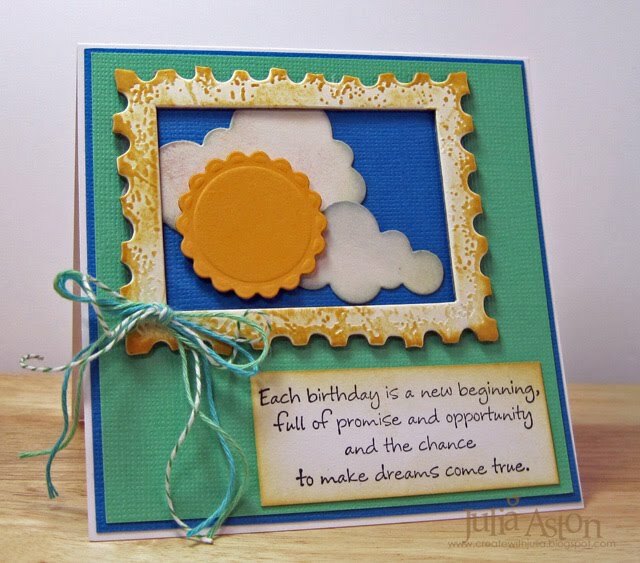 I used the frame and sentiment from Frame It to make this festive Birthday card. Banners just scream PARTY don't they??!! I love how Claire has different designs on each one. 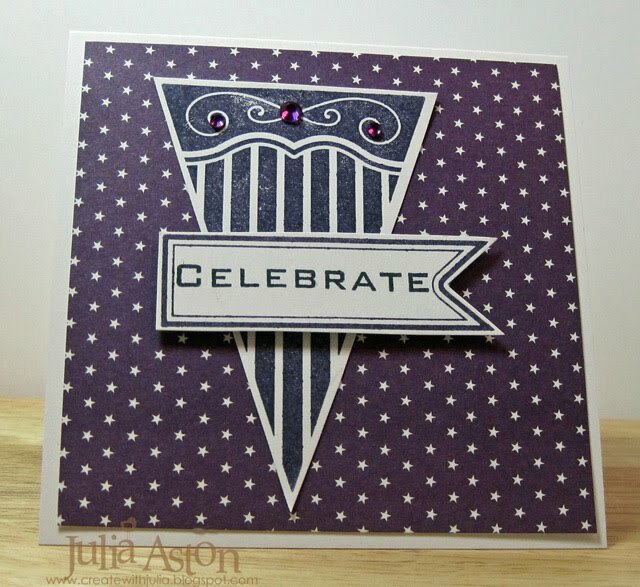 On this card I used one of the big banners from the new set Vintage Banners. 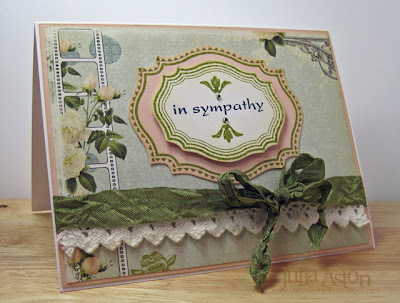 The ribbon/label is from Bitty Banners and the sentiment is from Free Spirit - Sentiments. And - Yes!!! 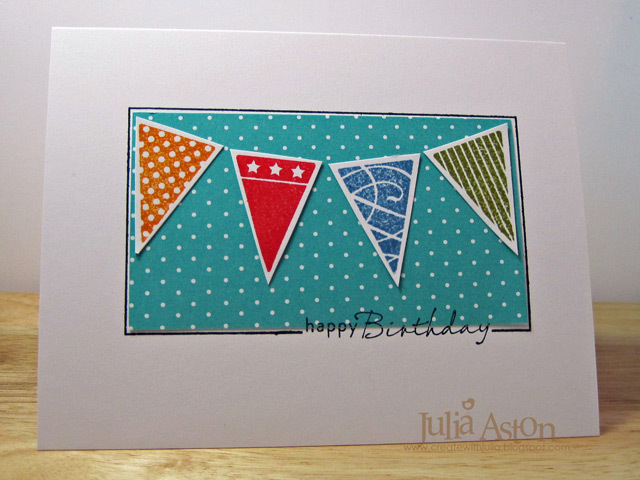 - The Vintage Banners stamps were designed to fit the Spellbinders Nested Pennants and Nested Lacey Pennants which will be available mid-March. 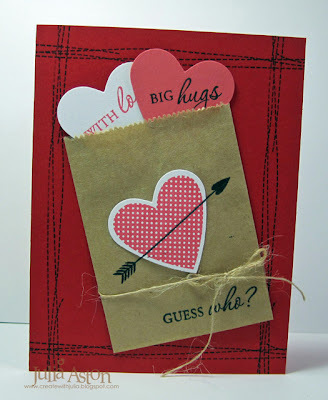 These are also very easy to hand cut as I did on my cards today. Please join us tomorrow for the Waltzingmouse Release Design Team Blog Waltz - get your list ready of what new rubbah you want - and be ready to comment - you might win a free stamp set! It will all begin March 1st at 2 pm EST! I'm heading over to the rest of the DT's blogs to see what they've made with these sweet banner stamps - want to come with me?? Just click on their links below! Ink: memento Tuxedo Black, Ranger Distress Spiced Marmelade, Barn Door, Stormy Sky, Peeled paint. Accessories: Gems - Creative Charms, foam tape. 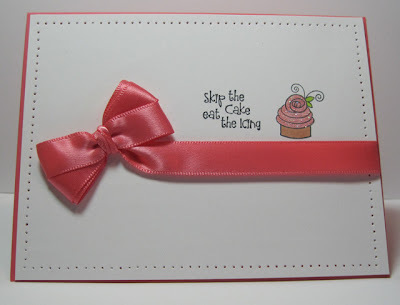 For my card today I layered 2 of the labels, one stamped on Sweet Blush and one stamped on white. Since I don't have the dies yet - I cut both labels out by hand. They are easy peasy to cut as they have nice flowing lines. I love how they look against this lovely piece of Webster's Pages patterned paper. I stamped one of the little decorative pieces included in this set above and below the sentiment and adhered a little bling on each. Finally, I added a strip of lace and tied the seam tape in a bow. 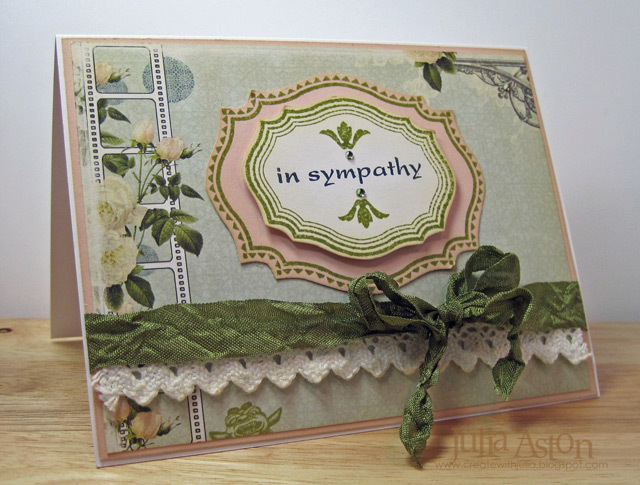 The sentiment is from Asian Gardens Additions. 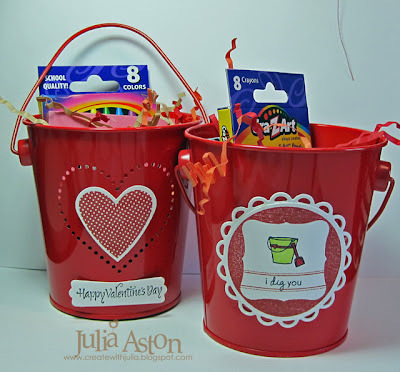 Please check out all of the WMS DT's blogs to see how they've used this lovely new set that will be available on March 1 over at the Waltzingmouse Shop! 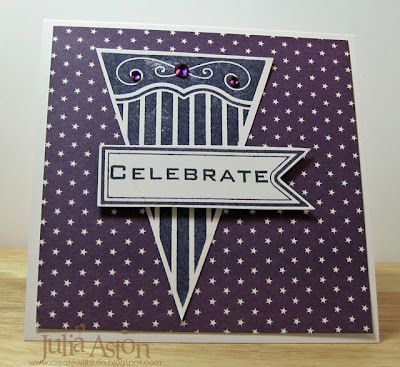 I hope you'll stop by tomorrow to see my peek at the final two stamp sets in the WMS March release - I think you're gonna love 'em!! Stamps: Waltzingmouse - labels from Vintage Labels 18 (available 3/1), sentiment from Asian Garden Additions. Accessories: foam tape, tiny gems - Taylored Expressions, wrinkled seam tape - Prairie Bird Boutique Etsy Shop, lace - Marks Finest Papers. Day 1 - WMS Sneak Peek - Round up the Posse!! Welcome to the 1st day of the Waltzingmouse March 1 Release Sneak Peeks! Today all of the Design Team members are previewing Claire's 2 wonderful new Western theme sets - Way Out West and Back in the Saddle. I got so excited about these 2 sets I made 3 cards to share today! 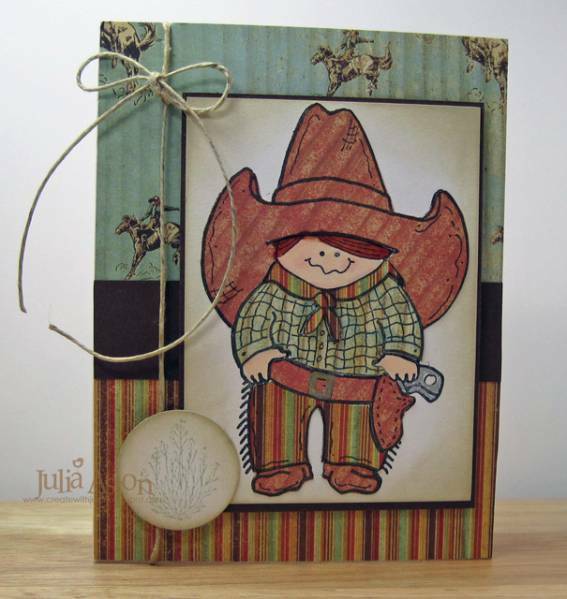 This wonderful woodgrain background stamp and the sherrif's badge are from Way Out West. 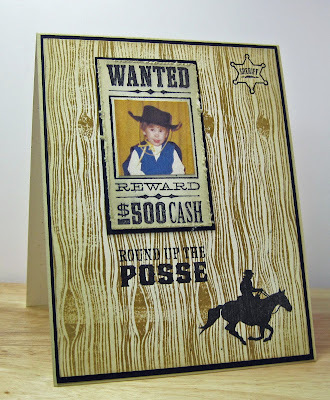 The wanted poster, sentiment and cowboy on the horse are from Back in the Saddle. 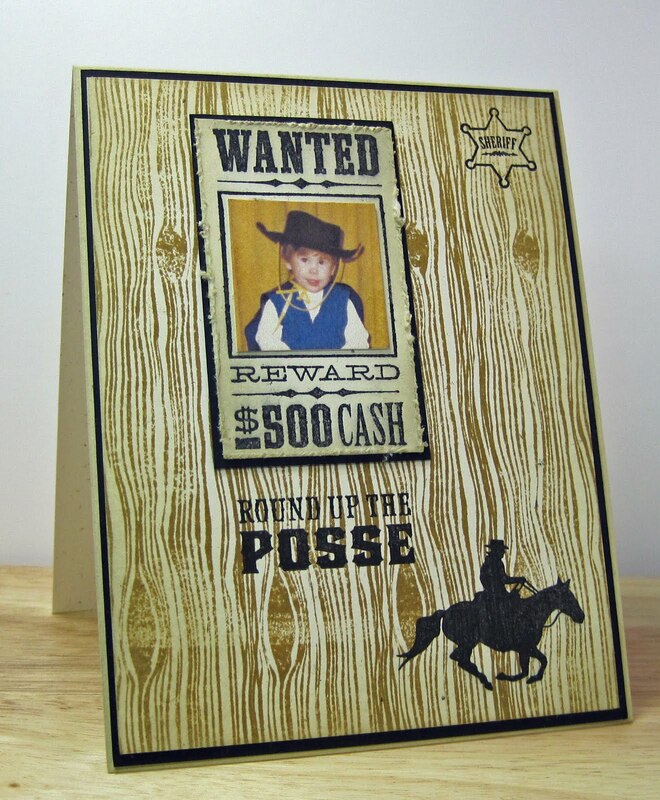 That little cowboy on the wanted poster is my son, Josh, when he was just 2 1/2 (he's now 33!) He always loved wearing hats; cowboy, fireman, spaceman, policeman, any kind of hat. (and when he grew up - he enlisted in the Army!) In this picture he also has on a Darth Vader cape from that year's Halloween costume. I'll save this card for his birthday in September. For my next card I wanted to show that you don't have to go all 'Yee Haw' cowboy to enjoy these sets. Here I just used one of the sentiments from Back In the Saddle to make a pretty thank you card. 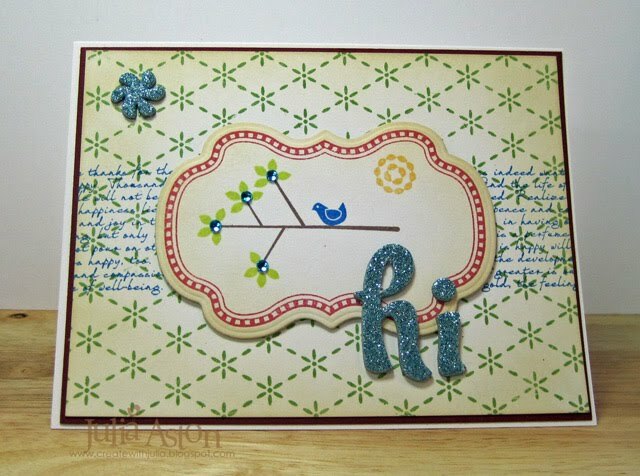 The sentiment fit nicely inside this Spellbinders tag. I sponged the tag before taking it out of the die. The Webster's Pages patterned paper matches the tag perfectly don't you think?? I wove 2 pieces of wrinkled seam tape through the tag and tied a bow. To finish it off I added two little gems to the scrolls in the sentiment. And my last peek is about as CAS as you can get! 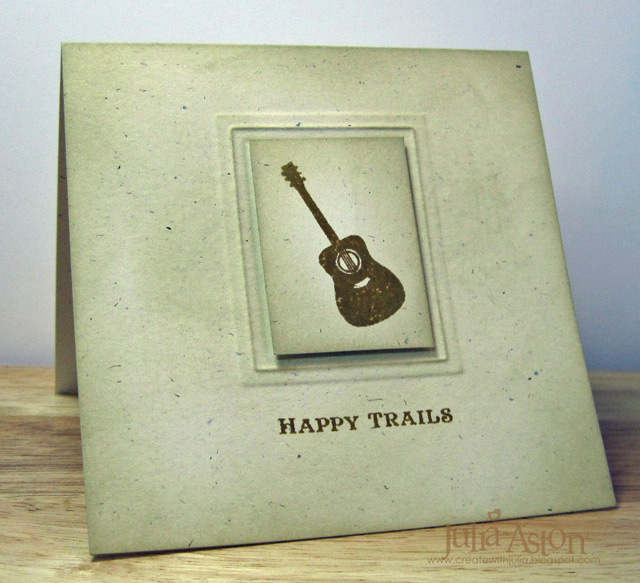 This fun guitar and sentiment are from Back in the Saddle. I dry embossed a rectangle Nestability for the frame, stamped the guitar on a scrap, sponged the edges and adhered it inside the frame with foam tape. 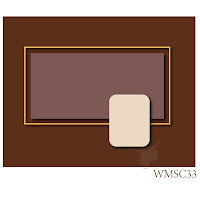 I hope you're excited about these new WMS sets - they'll be available on March 1 at the WMS Store. See you tomorrow for WMS Sneak Peek Day 2!! 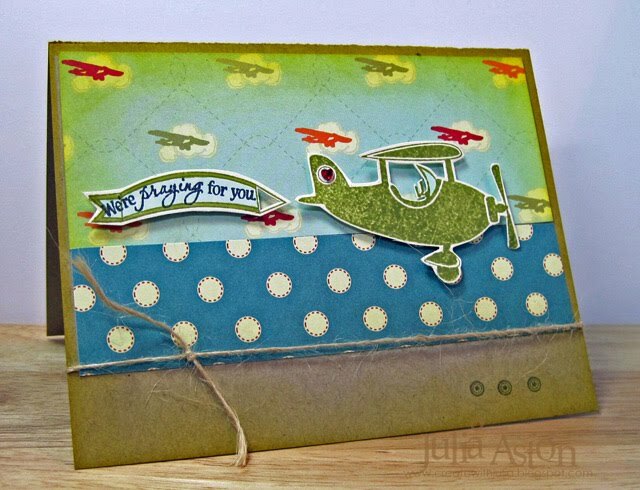 We've got another great stamp set to show you! Accessories: wrinkled seam tape - Prairie Bird Boutique Etsy Shop, Ribbon Tag Trio 2 - Spellbinders, Rhinestones - Kaiser, foam tape. Accessories: Rectangle Nestabilities, foam tape. Big congrats to Charlene (Willow1) for being the FS last week over at Split Coast. I had fun checking out her lovely gallery and finally decided to CASE her Time Flies tag . I am always intrigued by tags when I see them on peoples blogs but I don't often make them myself so this was a good challenge for me! 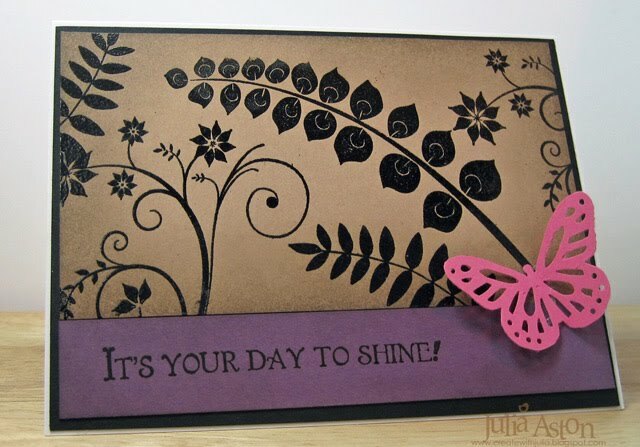 I used different stamps and a different theme from Charlene's but used a similar color scheme and did background stamping. 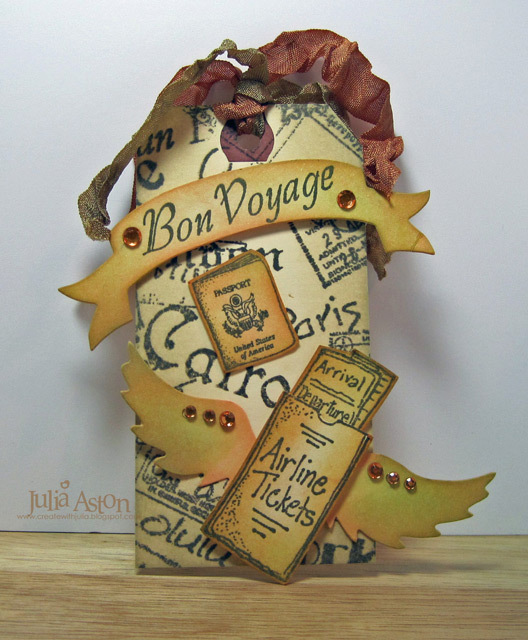 I used some new travel theme 'rubbah' that I just got from Rubbernecker for my tag. 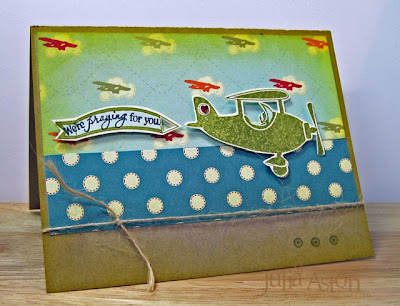 I stamped the background on the tag, then I stamped the sentiment cut with a Tim Holtz die and adhered it with foam tape after sponging the edges. 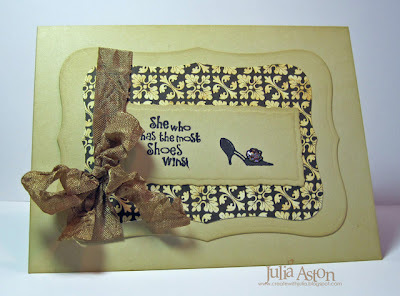 The wings are a Tim Holtz die also. I stamped the passport and ticket packet, sponged the edges and adhered them to the tag. Then I tied two different color seam tapes through the hole at the top of the tag and added my bling! This would be fun attached to some magazines or a music CD to give to a traveling friend, don't you think?! 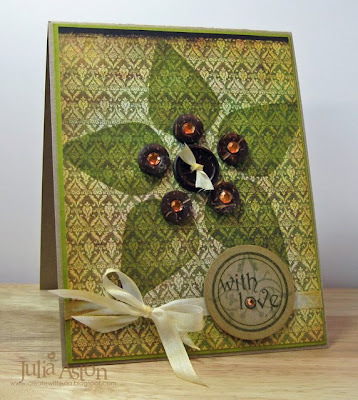 Lynn has posted the February Christmas Card Challenge over on the WMS forum! 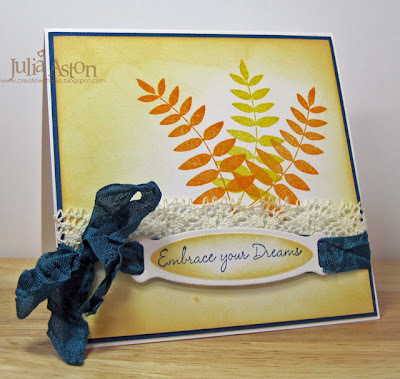 This month's challenge is called "Quick Pick" to use something on your work table to make your card(s). Here are 4 cards I made for the challenge this month. I usually clean up and put away all my stuff after I've finished a project so I have a (fairly) clean space when I sit down to work on something new. 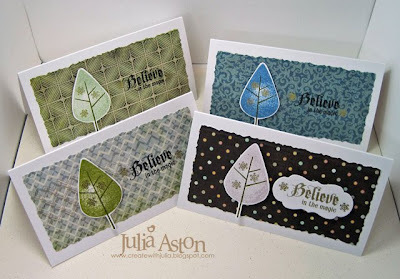 But, I did have a card front stamped with these 4 trees - that hadn't worked out the way I envisioned so it was just sitting in a basket where I put pieces of things not used. I cut out each tree and put one on each card using foam tape. I chose patterened papers that coordinated with the colors of the trees. 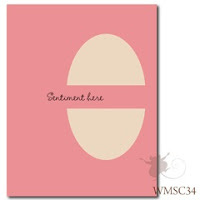 The papers are cut with Mega Deckled Rectangle Nestabilities. I stamped the snowflakes with gold ink on the trees and around the sentiment. So now I have 4 more cards made! You can read all about the monthly Christmas Card Challenges here on the WMS blog and here on the WMS forum in the Playroom. New challenges are posted on the 10th of each month! 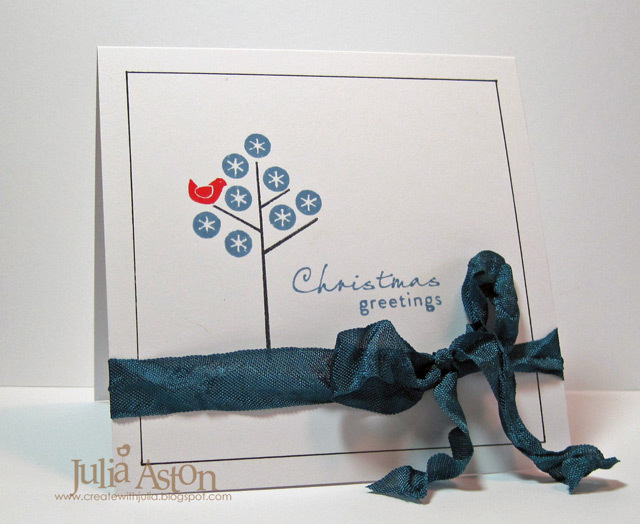 Stamps: Waltzingmouse - (sentiment & snowflake) Twas the Night Before Christmas, (tree) Teeny Trees. Accessories: mega deckled rectangle Nestabilites, Sizzlits lots of tags Labels 1 - SU, Foam tape. Happy Valentine's Day everyone! Thought I'd share the card I made for my DH Kent this year. I was inspired by a card I saw at CVS last week when I was picking up a little chocolate treat to give Kent with his card. 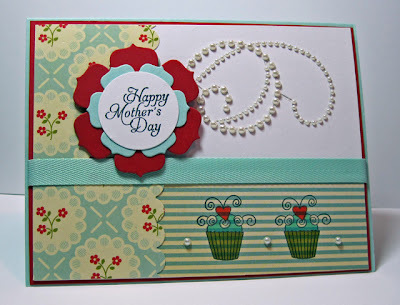 As soon as I saw the card - I knew I could re-create it with my Waltzingmouse Stamps - it was like the person had used these very stamps to make it! The store card had a little more shimmer and a red ribbon on it - but I thought I'd keep it clean for DH. 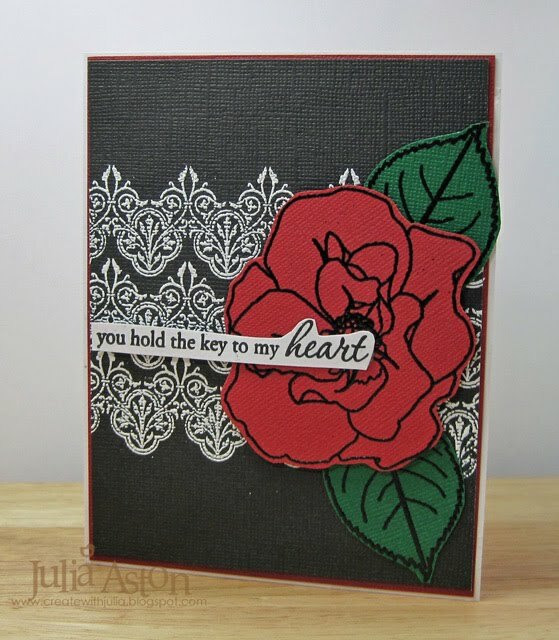 I white embossed the frippery on the black panel and black embossed the rose and leaves. I cut out the leaves and rose, adhereing the leaves over the frippery and adhereing the rose over the leaves with foam tape. Then I stamped my sentiment cutting around the shapes of the letters and adhered that with foam tape. I really love how this came out and I think Kent will like it too! (especially with the giant Reeses heart I'm giving him with it!) LOL!! 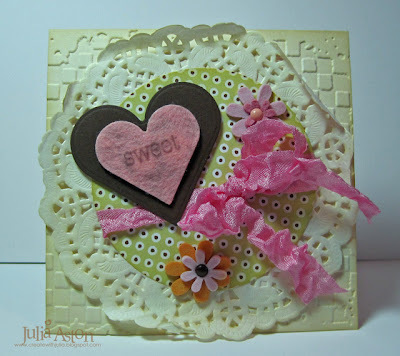 Inside I stamped two sentiments from Seasons of Love Tags and Sweet Hearts. 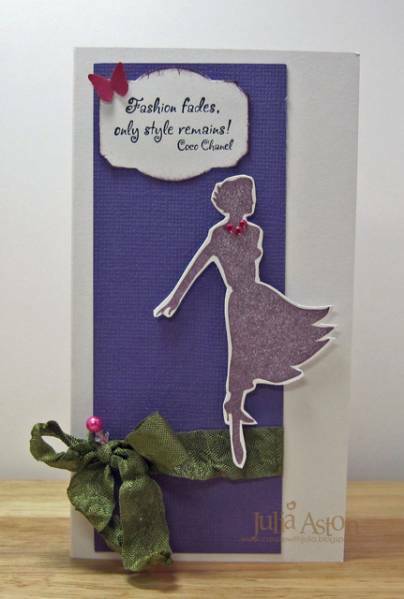 I hope you got a pretty card today from someone in your life and that you gave some too! Stamps: Waltzingmouse - Roses in Bloom, Sweet Hearts, Victorian Frippery, Seasons of Love Tags. Ink: Versofine onyx black, Versamark. Accessories: Black & white embossing powder, hot gun, foam tape. Wow - can it really be Saturday so soon?!? It seems like I was just posting last week's sketch and here's another one ready to inspire us! And here's my take on it today! I white embossed the large outline flower from Big Blooms - Chrysanthemums and cut it out. I stamped the big solid leaf from the set on the panel and adhere the bloom over them with foam tape. I tied the wrinkled seam tape around the panels. 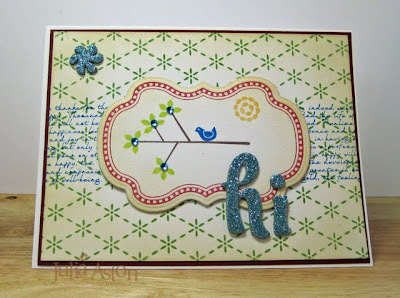 I sponged the purchased tag and stamped it with one of the little leaf stamps and sentiment from Teeny Trees. Then I tied the tag around the seam binding. To finish it off - I added the bling to the tag and the corner. 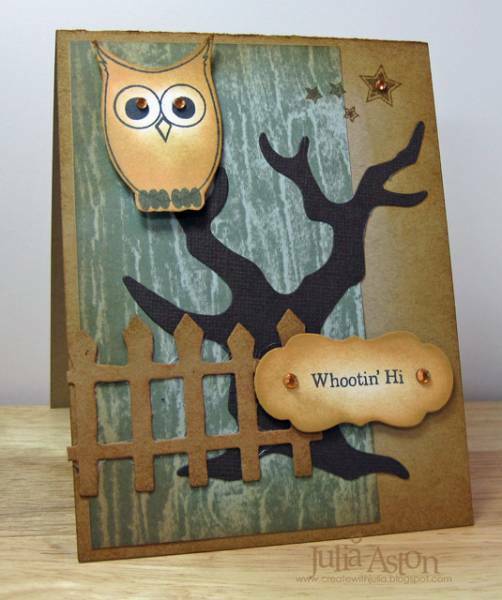 Then make your own card using the sketch and link it on the Sketch Blog by Thursday 2/17/11 at 11:59 pm EST - you could be chosen Top Mouse !! Winners are announced each Saturday along with the new sketch challenge. And there just may be a WMS stamp set to be won too! Last week the prize was 'Sweet Hearts'!!! 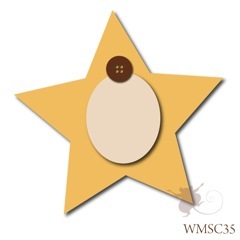 And don't forget the Friends of Waltzingmouse Blog Waltz being held in the forum on 2/17 - We're using buttons on our creations! Check it all out here. Come join the fun! 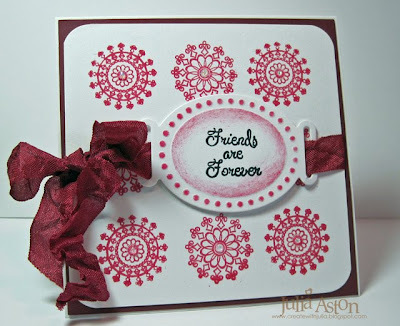 Paper: White - PTI, pink and cranberry - Coordinations. 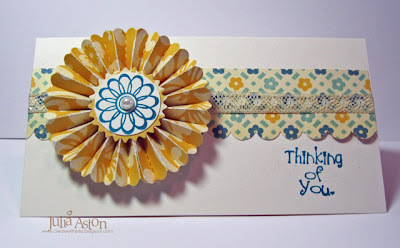 Accessories: Tag - Staples, hot gun, white embossing powder, wrinkled seam tape - http://www.prairiebirdboutique.etsy.com , narrow silk ribbon - PTI, Rhinestones - Kaiser. Hello Peeps! it's Saturday - Yippee! and time for another Waltzingmouse Sketch Challenge - can you believe there have been 33 of them already??? So - here it is! And here's my creation based on the sketch. I'm trying to think Spring in the middle of this blustery New England winter! 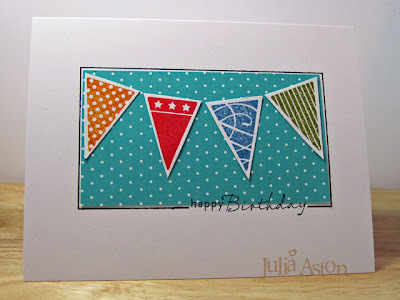 This also is for the Inspiration Challenge over on Split Coast - we had a fun web site Uncommon Goods to browse today. I was inspired by the colors on this wonderful mother/daughter apron set. We have two new Mischief Makers on the sketch design team posting samples today- please welcome these most talented ladies - Jen Cuthbertson and Jean Martin !! The DEETS: go check out the WMS Sketch Blog and get inspired by the cards the Mischief Makers and other DT members have created using this week's sketch. Then make your own card using the sketch and link it on the Sketch Blog by Thursday 2/10/11 at 11:59 pm EST - you could be chosen Top Mouse !! Winners are announced each Saturday along with the new sketch challenge. And there just may be a WMS stamp set to be won too! Hope to see you back here on Monday - I have exciting news! 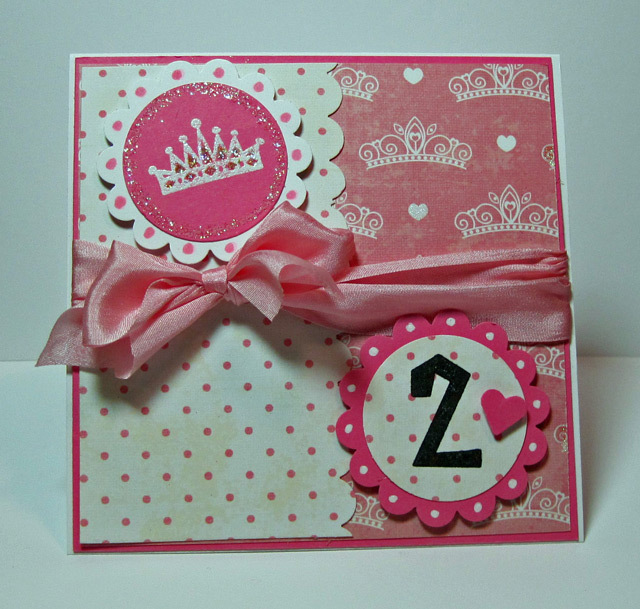 Accessories: Glitter letters - Thickers, foam tape, gems - Bazill Basic Papers, Labels 14 Nestabilities. It's Christmas Every Month in the WMS Forum! Waltzingmouse DT member Lynn is hosting a monthly Christmas Card Challenge over on the WMS forum! It just started so you can get right in at the start! 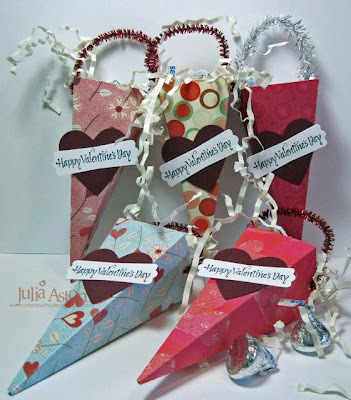 On the 10th of every month, Lynn will post a new challenge - January's challenge is to recycle something on your card. I had already thrown away my Christmas cards and we no longer exchange a lot of gifts (going for the better option of just spending time with family!) so I didn't have any cute tags to reuse. I was in a quandry - what could I recycle?!? 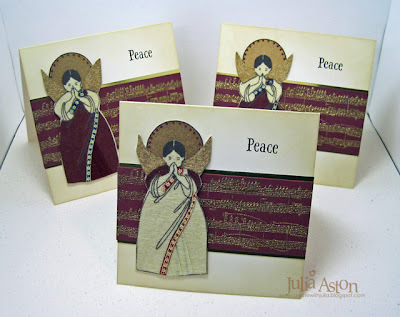 I did, however, save one card that my boss and his wife sent me that had three lovely angels on it. 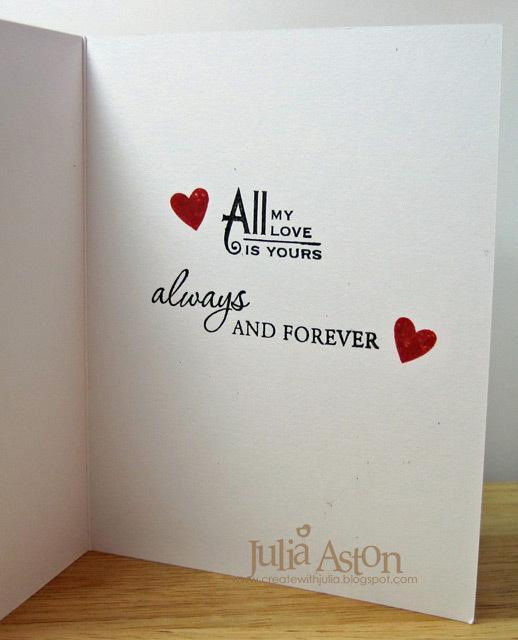 The card was handmade in Bangladesh. 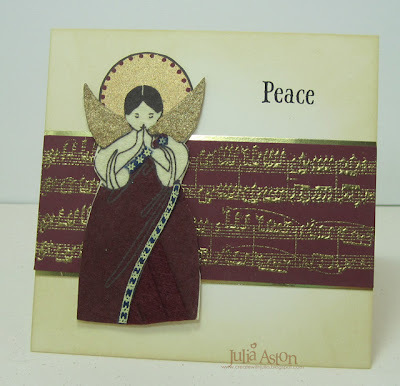 I saved it just because the angels were so beautiful - and when I saw it on the shelf in my craft room- I thought - a ha!! I will recycle that into 3 cards! 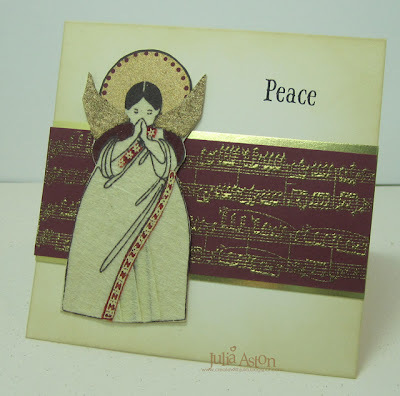 The angels' halos and wings are a gold textured paper and their dresses feel like a soft suede - they are just lovely - I had to curve the wings a bit as they were overlapped on the card. I chose the colors for my cards based on the colors of their outfits. 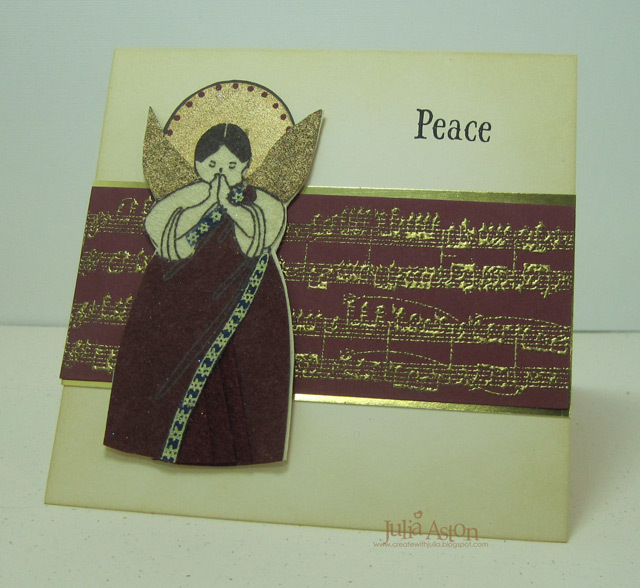 I gold embossed one of the WMS music stamps onto Scarlet Jewell paper, layered it onto gold paper and adhered it to the card. I sponged all the edges of the card with Antique Linen ink, adhered the angels over the panels with Scor tape to hold them firmly - and then stamped Peace in the corner. I never would have made these pretty cards if it wasn't for this challenge! And now I have 3 cards made for next Christmas! whoo hoo!! So check it out and add your 'recycle' card to the forum! There are prizes to be won! You can read about it here on the WMS blog and here on the WMS forum in the Playroom. I wonder what the challenge will be for February?! Accessories: Gold embossing Powder, hot gun, blending tool & Non stick craft mat - Ranger. Betty Wright has invited me to host some of theTuesday color challenges over on Split Coast for the next three months and today was my first time! Whoo hoo!! Boy - it's tricky choosing colors that haven't been done before!! And, of course, you want to pick colors people want to use while still being challenged! So - for my first shot out of the gate I chose 3 neutral colors - white, basic gray, and river rock. 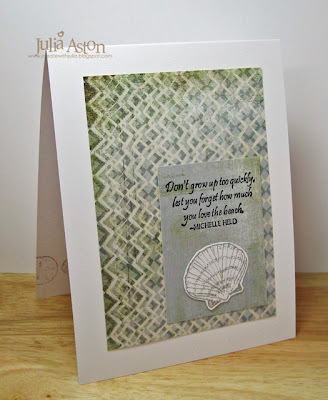 There's also a 'dessert option' that goes with the challenge - something extra you can do on your card if you want to - I chose using a background stamp as my dessert option this week. 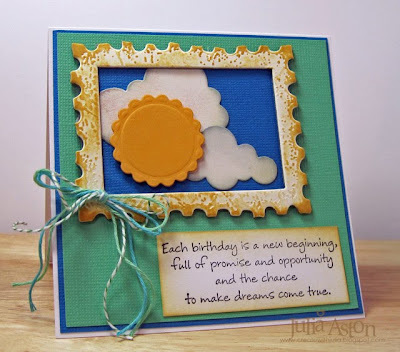 First, I dry embossed a square Nestability frame on the card. You can see my tutorial on how to do this here. I stamped the background text across the River Rock panel and adhered it to a gray panel. Then I adhered the panels inside the frame. 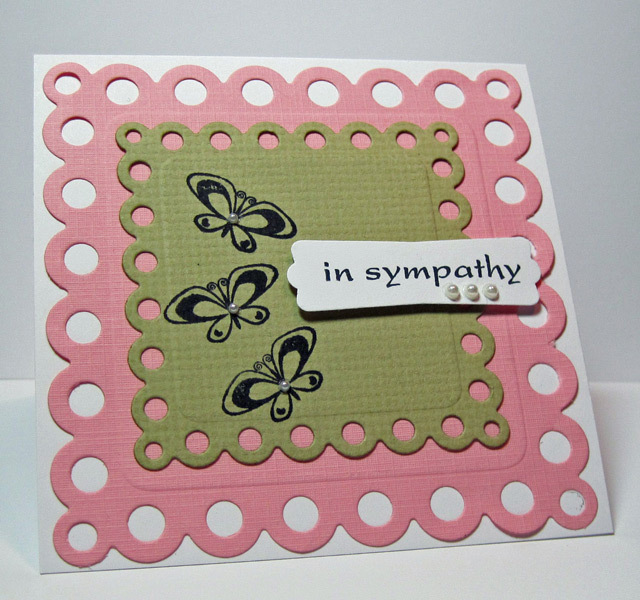 Next, I stamped the label, sentiment and scrolly and cut it with a Labels 10 Nestability. I adhered the label to the text panel using foam tape and added one little jewel to the scroll. So what do you think of the 3 colors I chose??? Let me know if you make a card using them! 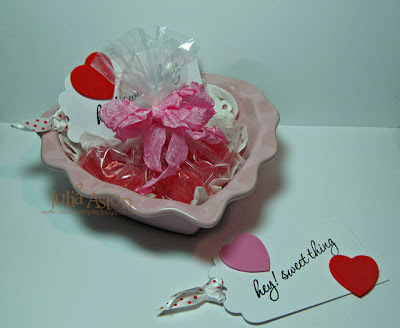 Accessories: Labels 10 and square Nestabilities, foam tape, gem - Michaels.